The Newport Plain Talk - NEWPORT—The ongoing efforts to raise money for a complete renovation and upgrade of Cocke County High School’s auditorium received a welcome boost this week through a $25,000 grant from the Wright Family Foundation. The Wright Family Foundation - We are pleased to announce that The Wright Family Foundation, Inc. is celebrating 20 years of giving in 2017. Established in 1997 to provide funding in support of neighborhood revitalization, jobs and career support, education, and social needs, initial funding for the foundation was provided with a generous donation from SI Group. Since the foundation’s inception, we have provided over 500 grants, totaling over 22 million dollars. But our enthusiastic community support and commitment to philanthropy extends far beyond monetary contributions. Foundation members also volunteer time and effort supporting local charities, chairing various boards, and attending events in support of our local communities. Heather Ward is guessing when she suggests that W. Howard Wright, her great-grandfather and founder of Schenectady International Group, wasn’t a warm and fuzzy kind of guy. However, while Wright may appear stern and austere in the handful of images Ward has of him, she says there’s no doubt of the man’s many fine attributes. Whether it was his brilliant scientific mind or his generosity and philanthropy, Ward thinks Wright was about as good a man as you’ll ever come across. That kind of spirit and concern for others is still prevalent at Schenectady International, according to Ward, and since 1997 has manifested itself in the work of the Wright Family Foundation. Graham, whose husband, Wallace Graham, was the SI Group CEO and remains chairman of the board, passed away four years ago and was replaced as head of the Wright Family Foundation by Ward. A Niskayuna resident, Graham was also a big fan of Proctors and longtime member of the board. The theater is honoring Graham’s memory by naming their new third-floor renovation space the Adeline Graham Theatrical Training and Innovation Center, or The Addy. 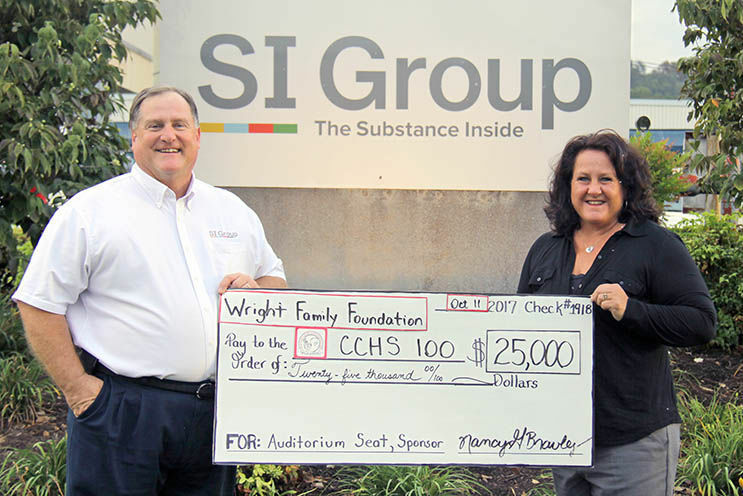 The Wright Family Foundation was created in 1997 with a large financial gift from the SI Group. Originally Schenectady Varnish when it was formed in 1906 by W. Howard Wright, the company changed its name to Schenectady Chemicals Inc. in 1962. In 1968, the company added its current headquarters location in Niskayuna to go along with its main manufacturing plant in Rotterdam Junction. The company employs more than 350 people in Schenectady County, and the Wright Family Foundation has handed out 450 grants to charities around the Capital Region totaling $18 million. Keeping their focus close to home has worked out just fine for the Boys & Girls Clubs of Schenectady. Bargy expects the foundation’s support to continue under Ward’s leadership. The Wrights’ contribution is also evident at the Music Haven in Central Park. The work of the Wright Family Foundation has brought a smile to many in the Schenectady area. Perhaps J. Howard Wright himself is looking down at his legacy, and smiling. Reach Gazette reporter Bill Buell at 395-3190 or bbuell@dailygazette.com. he Adeline Graham Theatrical Training and Innovation Center is all about the performing arts, but at Tuesday's press conference at Proctors announcing the new facility, it was hard not to think about the history of the space. Located on what was the third floor of the old Carl Company building, the new venue, shortened to "The Addy" and operating under the Proctors umbrella, will serve as both a training and performing space for students. It is expected to be open by October 1. "This must have been the floor for bedding and that kind of stuff," said Proctors CEO Philip Morris before officially kicking off Tuesday's press conference. "Now it's going to be the Adeline Graham Theatrical Training and Innovative Center. We're just thrilled." There were seven speakers at Tuesday's event, and nearly all of them couldn't resist talking about the history of the building and their personal connection to the space. Adeline Graham, a former member of the board at Proctors who passed away in 2012, was a lifelong Schenectadian and is the individual whose $500,000 donation made "The Addy" a reality. The total cost of the project is $2.2 million, which also included a $100,000 donation from Graham's husband Wallace, who also spoke Tuesday. "Adeline and I saw 'Gone with the Wind' at Proctors and decided to name our first daughter Ashley," said Wallace Graham, referring to the screen character, Ashley Wilkes, played by Leslie Howard in the movie. "Addy always spoke about Proctors and what an active and energetic place it was. She was not the most vocal member of the board, but she was certainly the most supportive of Proctors." Adeline Graham grew up as a member of the Wright family, which also had a strong presence at Tuesday's event. Heather Ward, Adeline's niece, is chairman of the Wright Family Foundation, a fund-raising arm of Schenectady International, which donated $300,000 to the project. "I have very fond memories of shopping at Carl Company when I was kid," said Ward. "I can remember buying a blue velour track outfit that I wore for days." Carl Company was a department store that opened in downtown Schenectady in 1906. They moved into a new building adjacent to Proctors in 1916 and remained there before finally closing its doors in May of 1991. The building was finally taken over by the county and then given to Proctors in 2004. "When Schenectady County first considered making the Carl Company a gift to Proctors we looked at it as a great opportunity," said Morris. "We moved our offices into the second floor of what was Carl Company, and used the first floor for the GE Theatre. But this space remained vacant. It took us a while to figure out what exactly to do with it, but as we watched the 'creative economy' bloom it became clear that this was a great opportunity to train young people into a business that has lots of work. Morris contacted Wallace Graham a little more than two years ago to explain the idea of "The Addy." When Adeline made the donation, there were no restrictions on what Proctors could use it for. "He asked me to lunch and I said, 'uh oh, he wants more money,'" said Graham, drawing laughter from the 50 or so people assembled at the press conference. "But I have to give Proctors a lot of credit. They could have used the money for anything; payroll, maintenance, repair. What Philip said was that he wanted to use Addy's gift for what we are here today for. The idea that were teaching high school and college students a broad range of trades and skills that all come together to make theater and film is great. This is a place that turns people's lives around." Proctors will use the space for its summer theater camp, and there will be a 100-seat venue which Morris said will also be used to show films. Also using a section of the third floor will be the Empire State Youth Orchestra and its CHIME program (creating harmony, inspiring music education). "We're going to have 65 kids from middle school and the upper elementary grades here every day after school learning music," said, Rebecca Calos, executive director of the Empire State Youth Orchestra. "Being in 'The Addy' will allow us to expand our groundbreaking CHIME program. We envision in the years to come a blending of our urban and suburban communities in this program. Kids will be able to rehearse together, form friendships together, and then go on to do amazing musical things together." It's the kind of program that the Wright Family Foundation looks to help according to Ward. "We are celebrating 20 years of partnership with Proctors," she said. "It's reach is far and wide, and we are honored to be a part of this project. We're all about neighborhood revitalization, jobs and education. We love Schenectady and we remain committed to it." Daily Gazette - The Wright Family Foundation awarded a grant in the amount of $30,000 to the Schenectady Hindu Cultural Center. The local newspaper in Schenectady, The Daily Gazette, covered the story here.